I hate my own kind. In SPJ, I get along best with the youngest members – and the oldest. But I can’t stand many who are my age. And I’m pretty sure they can’t stand me. I turned 49 last month. and many SPJ leaders are within a decade of me. Problem is, many people my age have embraced the worst traits of those slightly younger and older than us. Like the most self-satisfied thirtysomethings, we think we have it all figured out. Like the most reactionary retirees, we believe the best way to save the future is to double down on the past. Each individual is fairly cool. But put us all together, and we’re less than the sum of our parts. We don’t accomplish very much. My working hypothesis is that we’re all roughly the same age, except for the student members (who, with a few notable exceptions, do nothing but eat their stipends). I think most of us feel the vague pressure of middle age not to screw anything up, and we’re way past the risk-taking days of our youth. So we spackle SPJ’s corners while the foundation crumbles. We listened, but we didn’t do anything. No discussion, no motions, no votes. Carlson sits on the Sigma Delta Chi board, which is the autonomous fundraising and grant-giving wing of SPJ. Many SDX board members are former presidents and board members. They remind me of former college newspaper editors. If you ever served as editor of your college newspaper, and if you ever visited the newsroom a few years later, you probably watched the staff with a wry smile. All those editors, designers, photographers, and reporters scurrying about. Wasting calories on tiny details. Not contemplating the big decisions because they think they’ll always be there to make them later. Sometimes, it seems SDX board members feel the same way when they visit SPJ board meetings. A few always stroll in late, quietly pour a cup of coffee, grab a a danish (yes, board members receive free unhealthy noshes), and sit in the back. Every so often, as we get mired in some procedural discussion about annual report requirements or chapter ranking systems, I see them they lean towards each other and whisper. Then I watch as they sit back with wry smiles. Journalism has survived a mediapocalypse over the past decade, yet SPJ itself has changed oh-so-little. How can we represent an industry that’s rapidly evolving when we refuse to? SPJ keeps doing nothing until my generation of board members fades away, replaced by a younger and angrier one. These desperate newcomers ignore all advice from SPJ’s past leaders – because, honestly, where did that get us? – and lurch from one rookie mistake to another. They screw up SPJ in the opposite way, by attempting everything at once instead of nothing at all. Some SPJ leaders probably believe I’d love to see such anarchy. They’re wrong. Before I make any proposal, I talk to SPJ old farts I respect – Steve Geimman, Bill McCloskey, Mac McKerral, and the aforementioned Dave Carlson, just to name a few of my favorites. I have no interest in repeating old mistakes, and these guys (and sadly, they’re all white guys) know SPJ’s history because they lived it. For every crazy idea I’ve put forth, I’ve scotched twice as many because of their sage advice. They’re like those old college editors. And I’m glad they stick around for warm coffee and cold danish. 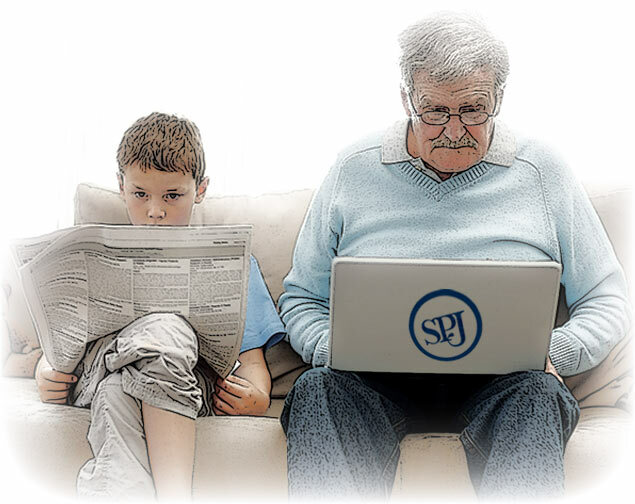 SPJ’s future rests in their wrinkled hands – if we don’t screw up the present. This is how I spent my Monday night. 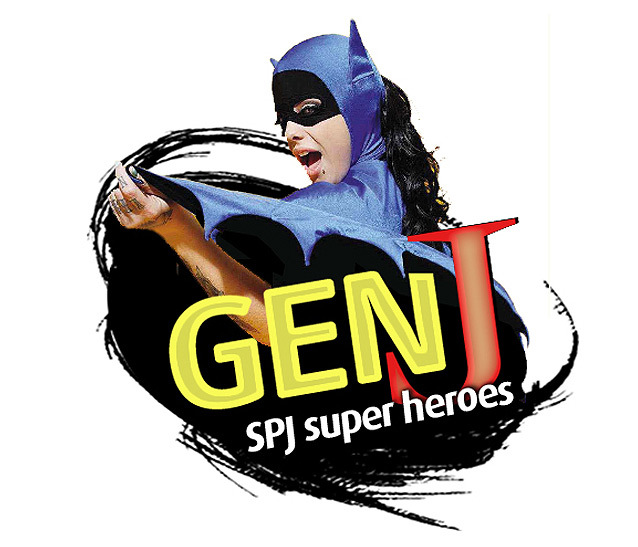 Yesterday, SPJ’s Generation J committee started soliciting logos that, you know, capture its essence. Here are the details. 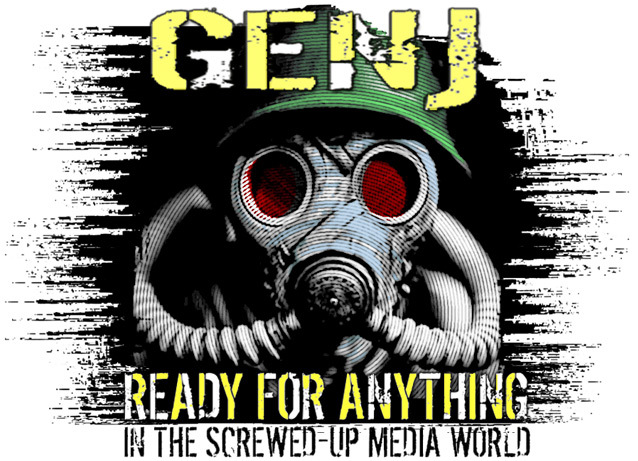 So what’s the essence of Gen J? Not a clue. It’s a committee of under-30 pro journalists who struggle mightily to represent that schizophrenic demographic – too old to care about college, not old enough to care about 401(k)s.
I’ve attended Gen J committee meetings before. 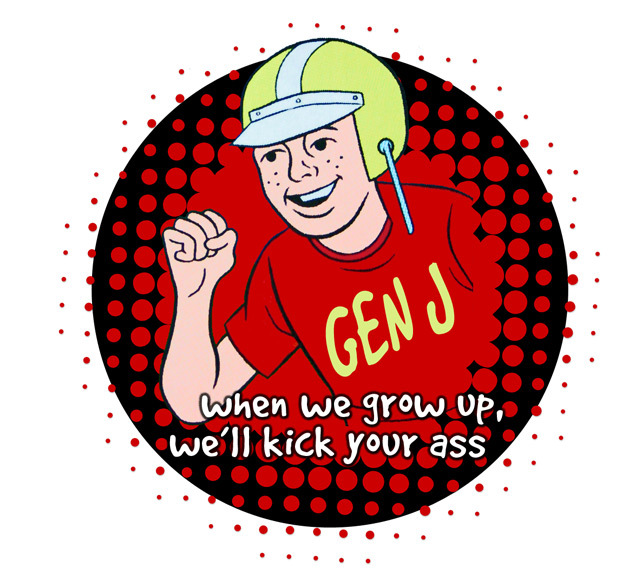 All I’ve really learned is that they call themselves Gen J, instead of Generation J. The rest of the meetings involve cultural references I can’t grasp. But they’re ambitious. They’ve hosted some of the edgier sessions at SPJ conventions, and they update their SPJ blog several times a month – which is the most out of all 24 (yup, count ’em) blogs that SPJ keeps alive, although not exactly kicking. Think you can design a better logo than me? If so, you win a free year of SPJ membership. But I like my chances. Especially with this last one – I hear the ’70s are in again, and spanking never goes out of style. Or am I wrong about that last part? The contest ends March 1. Here are those contest details one more time. SPJ’s inside baseball: a hit! Inactive chapters vs. deactivated chapters. If you don’t know what any of this means, you haven’t served on SPJ’s national board of directors. I have – twice. And even with a year in between my terms, these same boring topics have been discussed to death both times. 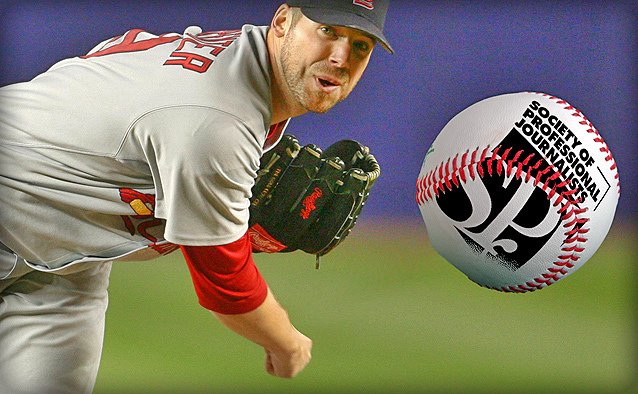 SPJ is obsessed with its own inside baseball. I realize every organization – especially one as large and as old (and yes, as lovable) as SPJ – needs to handle its mundane logistics. But SPJ tends to debate this stuff without truly resolving it. It’s no one’s fault, really. It just sorta happens with a 23-member board. But now I can proudly report: One officer is fixing one problem, and that might show SPJ how to hit others out of the park. If you’ve ever organized an SPJ chapter’s contest, you know the agony of buying the easiest/cheapest software and recruiting the fastest/bestest judges. But SPJ’s secretary-treasurer has devised a way to lessen the pain. More importantly – and more successfully – she’s created a centralized, organized system for finding contest judges. The old way was for each chapter hosting a contest to beg other chapters to swap entries – because you certainly can’t judge your own stuff. If you’ve suffered through the same thing, join Neuts for a free webinar at noon EST on Thursday, Dec. 20. She’ll explain how the judging swap works, give you a plain-English rundown of the software that’s out there, and answer your contest-related questions. First, she doesn’t just ponder problems, she attacks them. Second, we got in a big fight a few months ago. So we talked, found common ground on some stuff, agreed to disagree on other stuff, and kept working on her contest plans. To me, those are the ingredients SPJ should be cooking with – strong arguments, thick skins, and real work. I’ve said it before and I’ll say it again: There’s nothing more hypocritical than a thin-skinned journalist. So Neuts and the SPJ president she accused me of disrespecting are currently the two SPJ leaders I respect the most. Whether that’s philosophically consistent or psychologically unhinged, I leave it for you to decide. You are currently browsing the archives for the inside baseball category.